Q: General John Hyten, the commander of the US Strategic Command, said that China, Russia and the DPRK each assert distinct threats at varying tempos, and China poses unique threats to the US in space systems and war-fighting capabilities. General Joseph L. Votel, the commander of the US Central Command, also said that the United States must contend with growing competition from Russia and China across the Middle East, and he also referred to China's "growing military ambitions" in the region. What is your comment? A: Recently, we've been hearing a lot about this "China threat" theory from the US military. I cannot help but wonder that as the world's top military power with a military budget exceeding the total of the other top seven, how could the US still allege that it is threatened by others? It reminds me of the news about a senior US official of the State Department touting for F-35 fighter jets and other advanced weapons while in Asia. One has to ask what is the real motive behind the US fabricating various versions of "China Threat" theory? China's strategic intent is very clear. The fundamental purpose of our development is to seek happiness for the people, rejuvenation for the nation, and peace and development for the world. We hope that the US could discard its outdated Cold War mentality and view China's and the world's development in an objective and rational way. Q: According to the Reuters, Afghan President Ashraf Ghani said on February 28 that the Afghan government proposed a ceasefire, prisoner release, new elections involving the armed group and a constitutional review as part of a pact with the Taliban. The offer was made without preconditions in order to involve the Taliban in the peace process as a legitimate political organization. What's your comment? A: We have noted relevant reports. China supports Afghanistan in advancing the Afghan-led and Afghan-owned extensive and inclusive political reconciliation process and maintains that various factions in Afghanistan peacefully resolve their differences through political dialogues. The Chinese side commends the efforts made by the Afghan government and President Ghani to build national reconciliation. We hope that various factions in Afghanistan will work for the shared goal to strengthen dialogue and negotiation, put aside differences and realize the country's long-term peace, stability and development at an early date. 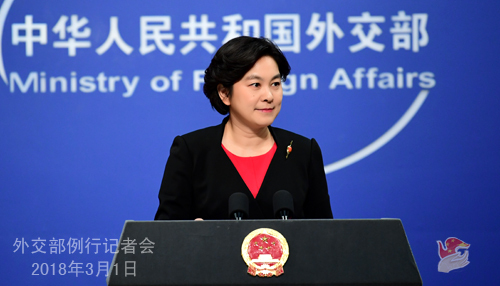 China stands ready to continue to offer its assistance as its capacity allows for Afghanistan's reconciliation and peaceful reconstruction process. Q: According to reports, an Australian scholar's book entitled "Silent Invasion: China's Influence in Australia" was published in Australia on February 26. The Australian business community and academic institutions have criticized the book as inventing stories for malicious sensationalization, condemning the author for poisoning Australia-China relations for achieving fame. What's your comment on that? A: We have noted relevant reports and that there is much criticism of the author and denunciation of the book. 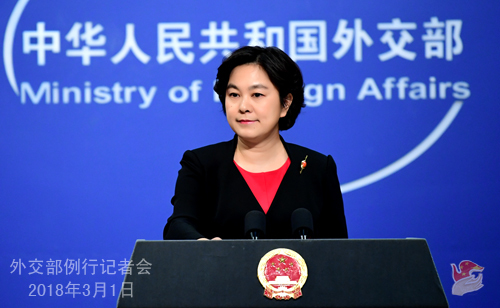 I would like to say that China has remained committed to conducting friendly exchange and practical cooperation with other countries based on such principles as mutual respect and non-interference in each other's internal affairs. Certain individual's malicious hyping up and slander on China are completely meaningless and good for nothing. Just as an ancient Chinese poem said, "despite the incessant cry of apes from the banks, the swift boat has already sailed through thousands of hills". Q: The US Senate has passed the Taiwan Travel Act. What is China's comment on this? A: Some of the act's clauses, though not legally binding, still severely violate the one-China principle and the three joint communiqués between China and the US. China is strongly dissatisfied with that and also firmly opposes it. We have lodged stern representations with the US side. The one-China principle is the political foundation of the China-US relationship. We urge the US side to adhere to the one-China policy and honor the commitments it made in the three joint communiqués, stop pursuing any official ties with Taiwan or improving its current relations with Taiwan in any substantive way. It must handle Taiwan-related issues properly and cautiously so as to avoid causing any major disruption or damage to the China-US relations. Q: Thailand's Commerce Minister Sontirat Sontijirawong said on February 28 that China's Belt and Road Initiative has brought more development opportunities for Thailand, like the Thailand-China railway cooperation project, which helps to strengthen interconnectivity and enhance Thailand's role as a transportation hub in the Indo-China Peninsula. Thailand and China are highly economically complementary, with highly compatible development strategies and immense cooperation potential. Thailand should look into how to catch a ride on the express train of China's economic development and realize common development. What is your comment? A: I remember that Malaysian Prime Minister Najib also made positive remarks on the Belt and Road Initiative the other day. This means that more and more countries, based on their own experience, are aware of the importance of the Belt and Road cooperation. Just like Malaysia, Thailand is also a good neighbor to China and an important cooperation partner with regard to the Belt and Road Initiative. The China-Thailand railway is a flagship project on production capacity cooperation in jointly implementing the Initiative in the spirit of wide consultation, joint contribution and shared benefits, which will help raise the level of infrastructure and connectivity of Thailand and the whole region and promote Thailand's economic sustainability. Greater alignment between China and Thailand on development strategies and steady progress on projects like the China-Thailand railway are beneficial not only to the two countries and peoples, but also to common development of the region. We will work with Malaysia, Thailand and other relevant countries to uphold the principle of wide consultation, joint contribution and shared benefits, strengthen cooperation on the Belt and Road Initiative and expand win-win outcomes for common development and prosperity. Q: King Tupou VI of the Kingdom of Tonga is on a visit in China. Could you talk about the diplomatic significance of this visit as well as agreements the two sides will sign? A: King Tupou VI of the Kingdom of Tonga is now here on a state visit from February 28 to March 8 at the invitation of President Xi Jinping. This is an important high-level event between China and Tonga as the two countries usher in the 20th anniversary of the establishment of diplomatic ties. During the visit, President Xi Jinping will hold talks with King Tupou VI and Premier Li Keqiang will also meet with him. The leaders of the two countries will exchange views on China-Tonga relations and other important issues of mutual interest. Apart from Beijing, King Tupou VI will visit Zhejiang, Hainan and Guangdong. Since the establishment of diplomatic ties between China and Tonga 20 years ago, the China-Tonga relations have made great headway. Under the guidance of the important consensus reached between President Xi Jinping and his Tongan counterpart in November 2014 on building a strategic partnership featuring mutual respect and common development, the China-Tonga relations have entered a new stage of rapid development. The exchanges at the high and other levels between the two sides are close and fruitful outcomes have been achieved in exchange and cooperation in trade and economy, agriculture and fishery, infrastructure construction, people-to-people and subnational interactions and other fields. The two sides have also maintained sound communication and coordination on international and regional affairs. As we celebrate King Tupou VI's visit and the 20th anniversary of the establishment of diplomatic ties, we will take this opportunity to work with Tonga for deeper political mutual trust, more practical cooperation and greater development of China-Tonga relations. We will timely inform you of more information when we have it. Q: Washington Post and other media outlets reported that the US administration is planning on imposing heavy tariffs on Chinese steel and aluminum to stop China's unfair trade practices. What is China's response to this? A: Head of the Trade Remedy and Investigation Bureau of Ministry of Commerce Wang Hejun has already stated China's position on the issue you mentioned. The US' unreasonable and excessive use of trade remedy measures will not help revitalize relevant industries at home. Rather, it will affect its employment and jeopardize the welfare of American consumers. 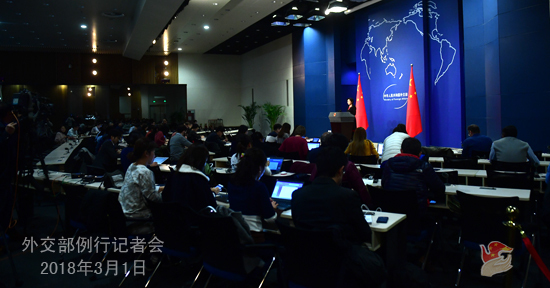 China will take necessary measures to safeguard its legitimate rights and interests.